Which Combination of Streaming Services is Worth Cutting the Cord From Cable? Every major communications company either has a streaming service or in the process of launching one. What does that mean for your wallet? Lately it seems as if everyone is looking for options to help them“cut the cord” from cable to save money on ridiculous cable and satellite television bills. Cable and satellite coerce customers into paying exorbitant fees for bundles of channels that most do not even watch. When I lived and worked in the Middle East, certain internet sites were blocked because they violated the countries' laws (pornographic sites, gambling sites, certain video game sites, streaming sites, etc.). Here, in the U.S. our internet service providers or ISPs are required by law, to not block any webites for any reasons. In otherwords, the internet is to remain open and companies are not allowed to block sites in order to get customers to pay more. In 2015, the Federal Communication Commission or FCC reclassified high speed internet as a public utility--a public good, including it in Title II of the Communications Act of 1934. That means they internet service providers are considered a "common carrier". Net Neutrality is the principle that Internet service providers ISPs should allow access to all content and applications regardless of the source, and without favoring or blocking particular products or websites. It's the idea that all Internet data should be equal. That the Comcasts and Verizons of the world can provide the pipes but should have no say in what passes through them. The Internet providers shouldn't be allowed to charge different companies more or less for their data or to slow down, or block, access to Web sites and services they don't like. Not all data is equal and companies should pay their fair share of the internet. Internet companies like Netflix and Skype are taking up too much data. Open internet stifles competition and innovation. Those who are opposed to Net Neutrality argue that consumers' fears of ISPs abusing their power is unfounded. History, unfortunately, proves otherwise. FreePress compiled a list of Net Neutrality violations by ISPs like Comcast, Verizon and AT&T, doing the very thing they want us to believe they would never do. These violations include throttling data, blocking ports and websites and redirecting internet users to the browser of their choosing. In January 2017, the FCC's policy to uphold the laws of Net Neutrality shifted with the appointment of Ajit Pai as chairman of the FCC. Pai, who served as a lawyer and lobbyist for Verizon seems to still be protecting Verizon's interests and not the U.S. the interests of consumers and businesses. Almost immediately after his appointment, Pai got to work on repealing Net Neutrality. And on December 14, 2017, Congress voted to repeal the internet's Title II status, reversing net neutrality. Luckily, Pai has yet to finalize the repeal. This gave the U.S. Senate time to vote on May 16, 2018, to reverse the vote to repeal Net Neutrality. I know. It's a lot. The U.S. Senate voted 52-47 to put the FCC's Net Neutrality rules back in place. This doesn't mean that Net Neutrality is law of the land once again. The House of Representatives also have to vote on it. It's unlikely, however, that it will pass the House because of the $101 million ISPs Verizon, AT&T and Comcast contributed to politicians campaigns and PACs. This is not a real Verizon package, only a visualization of what a package could look like should Net Neutrality be eliminated. Small businesses could be charged exorbitant fees to build websites on WordPress, Squarespace. Video game prices could rise because of the reliance on online gameplay. This in addition to consumers having to pay more for an internet package that will allow them to play video games. The laws that govern ISPs are very necessary in order to preserve a free and fair internet. And this is where we need your help to ensure our internet remains free and equal. Vote. Midterm elections are vastly approaching. If you support keeping the internet open, vote out those politicians who would see Net Neutrality dismantled. Tell us what you think about Net Neutrality in the comments. The woman-led, woman-centric dating app, Bumble, repeatedly declined Match Group's offer to buy. Now Match Group is suing for patent infringement. In Forbes December 2017 issue, Bumble founder Whitney Wolfe Herd made the "30 Under 30" list, with Bumble being worth $1 billion. Bumble has over 18 million registered users, with more than 1 billion matches made since its launch. And Match Group is the parent company for Match.com, Tinder, PlentyOfFish, OkCupid and HowAboutWe. Naturally, Match Group would want to acquire the dating app that's giving them a serious run for their money. While Match Group's attempt to buy out Bumble looks like nothing more than business as usual, the history between Match Group and Bumble is anything but. Herd, then just Wolfe, was one of the co-founders of Tinder along with four other co-founders, including then-CMO Justin Mateen. 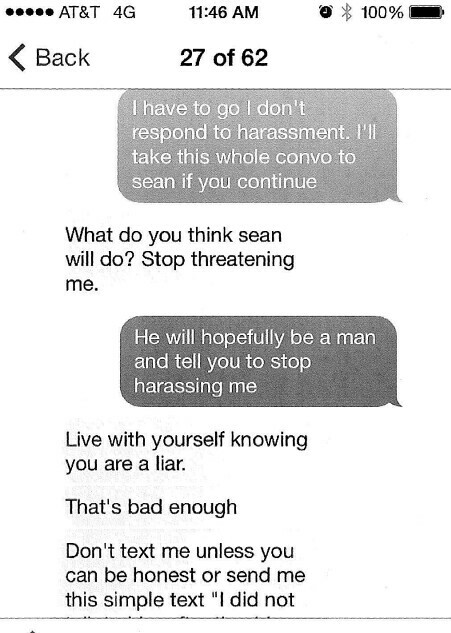 In 2014, Wolfe sued for sexual harassment and the receipts Herd shared paint a pretty horrifying picture of what she had to endure during her tenure at Tinder. Here are the receipts straight from the lawsuit. The deposition shows that Herd and Mateen dated briefly. However, the texts show that their relationship was one where Herd was constantly being accused of flirting or cheating. Even Herd's description of how they, allegedly, first began dating is problematic af: Mateen summoned her over to his house because he was distraught about an ex-girlfriend. When Herd refused, he told her that he would be very upset with her at work. Even though she complained to partner and then CEO Sean Rad about Mateen, Herd's pleas for Rad to do something about Mateen went ignored, save for him calling Mateen "nuts" and instead called Herd "emotional" and "dramatic." The lawsuit was eventually settled out of court with no admission of wrongdoing on either side. The evidence, though is quite to the contrary. Rad was forced to step down as CEO, but was reinstated after five months. In 2017 Match Group, where Rad is still chairman of Tinder and very influential, tried to acquire Bumble for $450 million, even though Bumble is worth $1 billion. Bumble turned down the offer, but Match Group came back with a $1 billion offer, even though the group does not have the cash on hand. Now, Match Group is suing Bumble for patent infringement--the design patent for Tinder’s swipe-to-connect feature. Bumble's response to the lawsuit? ”We as a company will always swipe right for empowered moves, and left on attempts to disempower us. We encourage every user to do the same. As one of our mottos goes, “bee kind or leave. hough both Bumble and Tinder dating apps allow seekers to swipe right for yes and left for no, Bumble's app is more woman-friendly, requiring the woman to make the first move should she and her potential both swipe right for each other. Bumble has also added BumbleBFF to help people find friends in their area as well as BumbleBiz for networking relationships. Suing for patent infringement could be a way for Match Group to intimidate Bumble into joining the groups already growing number of dating apps. But Match Group has to know that after having a partner not check a coworker--nay, fellow co-founder for sexual harassment, why would Herd want Bumble to be associated with anything that has to do with them? It just goes to show that they still don't understand that no means no and corporate bullying doesn't make anyone want to say yes. ONCE JUST A FIGMENT OF SCI-FI WRITERS' IMAGINATIONS, VIRTUAL REALITY PUTS USERS INSIDE WHOLE NEW WORLDS IN BOTH FILM AND VIDEO GAMES. Video games have become more and more immersive with role playing and first-person shooters. You feel as if you are there in that environment, interacting with objects, non-player characters, and, in some instances, other players. Similarly, movies have become incredibly immersive with 3D, IMAX, and 4D experiences. With the increasing technical advancement, virtual reality will break the already crumbling barrier between movies and video games. Think about games such as Heavy Rain, an interactive video game thriller where your decisions and actions determine the outcome of the story. In Heavy Rain, the protagonists must stop the Origami Killer who drowns his victims with prolonged exposure to rainfall. The game already acts as an interactive film that you can control. Imagine playing this game and being able to feel raindrops on your head—on your arms—while playing as your character. Virtual reality makes this type of gameplay possible. Imagine being Katniss Everdeen and exploring her world across all four of The Hunger Games films. In 2015, Samsung, Lionsgate, and Reel FX animation studio collaborated to bring fans of The Hunger Games series a 360 virtual reality experience. The 3D experience "allows viewers to explore key moments throughout Katniss’ [sic] journey, across all four films in the series." Films have also created immersive environments with 3D, where the characters look as if they are coming out of the screen toward you, and 4D, where theaters add physical elements to the viewing experience such as smell. With VR, films are elevated to even greater heights, allowing you to become fully immersed in the film. VR adds an element of interactivity for film that goes beyond the trivia questions that accompany DVDs. With VR, games and film put you in a 360 degree world where you experience the story from the point of view of a character or even an object. In some films or games, your decisions determine the outcome. In others, you, the viewer make choices, but are still left in the dark as to the ending of the game or film. For example, similar to the game play of Heavy Rain, the film Broken Night explores a woman's (Emily Mortimer) unreliable narrative of an intense trauma. Speaking to a detective, her confused memories unfold: returning home in the midst of a fight with her husband (Alessandro Nivola), they encounter an intruder. The viewer is placed in a position of choosing which memories to follow, sharing her confusion before coming to the startling truth. As VR puts the viewer in the thick of all the action, films and video games become even more story-driven and viewer focused. The lines of game play and film are indeed blurred with the increased technological advancement of virtual reality. VR can make video game play seem as if the viewer is inside of a movie. And in that same token, films have an element of video game play, such as making choices and interacting with objects and people. With virtual reality you don't just play video games. You don't just watch films. Soon, when we hear about an interesting film or game to be released, we will say, "I can't wait to experience it."